Back in 1978 it was mentioned by Alan Garside during the first AGM that the club should model Ramsbottom Station and surrounding area’s. This was agreed by all the members present at that time and this set the ball in motion to create the layout. The period had been set for 1940/50’s but along the years we have changed that to 1950’s and 1960’s because of models that are available these days. 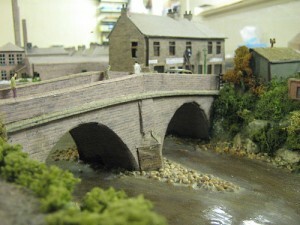 Left – Right :- Peel Bridge with the start of Peel Brow and Ramsbottom Paper Mill. 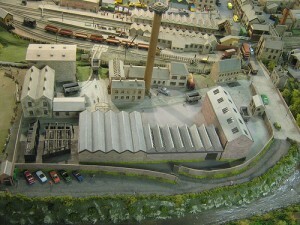 Left – Right :- Shows Nuttall Tunnel and also a general birds eye view of Ramsbottom Station and Town. 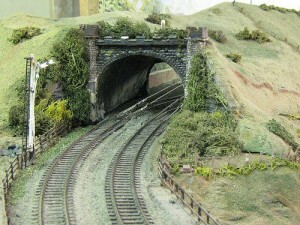 The first thing the members of the club decided was to get an idea of what the layout and area was like. Apart from most members living in Ramsbottom, They also used old O.S maps borrowed from Ramsbottom library and making a larger plan on paper to put onto the base boards. 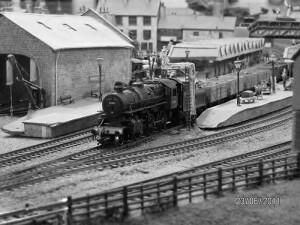 The gauge they had decided was to be 00 gauge as it seemed a reasonable size scale and one that was generally most common at the time. 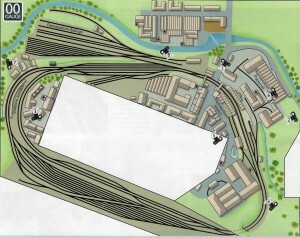 They decided to model Ramsbottom Station to scale with all features of the past and all track work on the O.S Map, this was possible upto a certain point for example there were 50 sidings in Ramsbottom sidings which they decided they would have 9 which with the new extension we now have 15, This gives us more space to store stock ready for the program and other shunting needs. The layout is a giant oval or as other people call it a tail chaser, this makes it a lot easier for running rather than having an end to end. It has two running lines these are called an up and down lines. 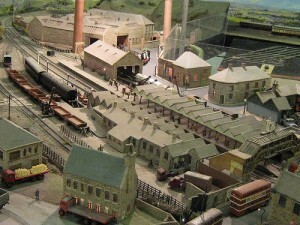 The up line starts in the fiddle yard, heads out of Nuttall Tunnel, past Nuttall Park where you have access into Ramsbottom goods shed, then into Ramsbottom Station, from there it heads towards Stubbins on a embankment that goes up in height, along this embankment you have access to the coal sidings and loops, from there it can either head up towards Rawtenstall or towards Accrington which either way head back into the fiddle yard for another run around. The down line starts in the fiddle yard, heads past Stubbins Station from either Accrington line or Rawtenstall line and heads off down the embankment when you have access to the loops and the joining from Ramsbottom Sidings, after that the line heads into Ramsbottom Station, just after the station you have access to Ramsbottom Station Goods yard complete with paper mill sidings, after that it heads past Nuttall park, through Nuttall Tunnel and into the fiddle yards where there is a point to go into the Accrington or main line parts. 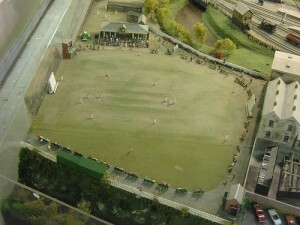 Left to Right :- Shows a view looking down Bridge Street towards Ramsbottom Station and a birds eye view of Ramsbottom Cricket Club. 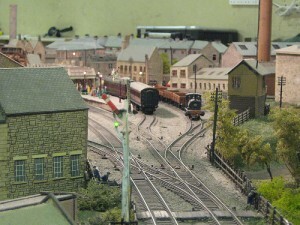 Left – Right :- Two views of Ramsbottom Station. 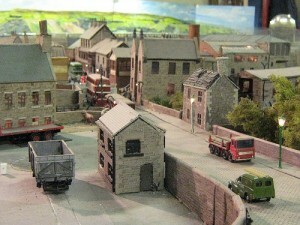 All of the buildings on the layout have been scratch built from pictures, photographs, books, ariel views, new maps, old maps and memory. 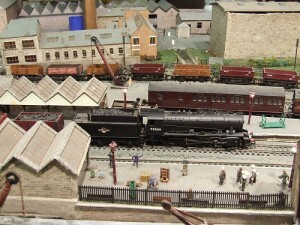 Members were able to aquire these items from libraries, Heritage Centre’s, Pubs, The East Lancashire Railway and more. Most of the building were built by Alan Garside and members from the past but lately with the new extension, Alan Garside has been making the Mills and Keith Cragg has been making the houses. All the buildings you see in our pictures are all made from a type of wood called Balsa wood which in turn is covered with brick, stone and slate paper added to create effect and realism. The layout has 5 Gauge Master Controllers that powers 2 front boards, 2 back boards and 1 board for the sidings. The 2 back boards and the sidings boards have their points controlled by a live probe method. The 2 front boards have a different arrangement for their points, these are controlled by toggle switches with confirm buttons. We also have working signals that will activate when points are changed with signal lights adding to the effect. One of our “special” feature on the layout has to be our working level crossing which is powered by a motor and a meccano set hooked up to 4 gates which also activates the signals in and near the stations. The mechanics to it as so delicate that if the gears slips you sometimes find you have one gate not shut and thats when accidents happen. We have had a few accidents with a few replacement gates being needed as a train vs a level crossing gate is no match. But all in all this is really a great feature for visitors to view. 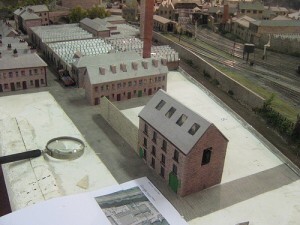 Left – Right :- Field Mill on Kenyon Street during construction of Kenyon Street in 2010 and the weigh station in the Paper Mill. 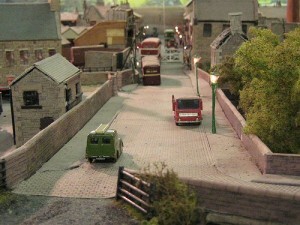 Each house, mill and building on the layout included street lights are powered by AC and DC 12v lights. The street lights are AC voltage where as the rest are all DC. These all use grain of wheat bulbs with the older type needing 100 Ohm resisters where are the newer type already have them built in. Each set of lamps has a transformer to a section these are 230v-12v types and in some areas under the layout are clipper controllers used for there outputs. The wiring in use is simple bell wire or in our instance cat 5 as its colour coded, so we have Green and White for Street Lamps, Orange and White for houses/mills and blue and white for the points although original members and others (mentioning no names) for awhile used any colour so this does make things trick these days. 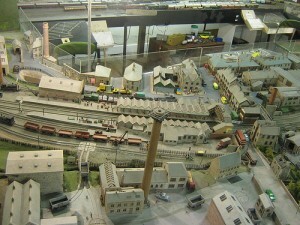 The layout includes the following Streets :- Bridge Street, Garden Street, Peel Brow, Kenyon Street, Railway Street and Bolton Road North. But due to the confined space some areas have had to be squeezed up together to make it possible to run.